Founded in 1984, Giovanni Photography is a full-service residential and commercial photography and aerial videography studio now in business for 32 years. After graduating from New York Institute of Technology in 1983, founder John Sciarrino decided to make this beautiful coastal community of Naples his home and opened his first studio. His business grew steadily, along with his skill to create beautiful portraits and to capture wedding couple’s precious memories. Giovanni Photography soon expanded its services to include commercial photography including architectural, product, and advanced digital imaging and has now become a major contributor to the luxury home industry. John’s photography has earned him hundreds of awards from The Southwest Florida Professional Photographers Association and The Florida Professional Photographers Association, including “Photographer of the Year” on five separate occasions. He is published annually in over 700 pages of editorial articles, advertisements, and magazine covers in local publications like Home & Design, Gulfshore Life, and Naples Illustrated. In 1998 John expanded his services to include aerial photography using a unique system called Blimp Cam, a system that allows photos taken remotely from a helium filled blimp from as high as 400 feet. The Blimp Cam aerial photography system was state-of-the-art technology at that time and could hover overhead with no aircraft noise, capturing unique aerial images that conventional aircraft could not provide. Always staying on the forefront of new technology, Giovanni started researching, developing, and building a more modern system called UAVs, (Unmanned Aerial Vehicles) known by most as ‘drones.’ In 2013, he retired the Blimp Cam and pursued and garnered the elusive FAA regulation called the ‘333 Exemption’ that would legally allow his use of drones, making him one of the first in the area to be granted this important qualification in Southwest Florida. 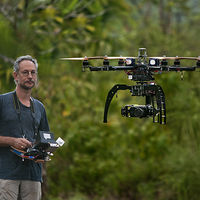 The video and still footage he has captured has contributed greatly to the marketing of his clients’ projects via expert and compelling aerial footage. Feel free to browse this website to explore the hundreds of images in the Giovanni Photography portfolio. The true art of John’s photography is measured by his thousands of satisfied clients since 1984, hundreds of whom repeatedly retain him to capture their latest projects. John’s photography, like the name Giovanni its Italian counterpart, conveys the elegance and artistic achievement of old world master craftsmen and artists.